Fortress Of Freedom Board :: View topic - Jessica King Begins Work with FOF Records! Jessica King Begins Work with FOF Records! Posted: Mon Dec 29, 2008 12:57 am Post subject: Jessica King Begins Work with FOF Records! The Fortress Of Freedom Corporation through FOF Records, is pleased to announce that Jessica King has begun work on her musical career. It was last July when we first signed up Jessica and now we have taken the first steps to creating the next "Canadian singing sensation!" Jessica arrived at our offices today for some sample vocals and an impromptu photo session as we begin to create an image for her to present to the world. We started with some vocals. Jessica has a style of singing that is very up-front. For example, she stares right at me as she sings in comparison to our Emily who closes her eyes and sways to the beat. Just an observation. 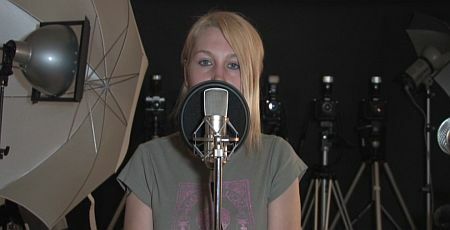 A screen capture of Jessica singing a song. Next up were some "mug shots" and some simple poses that we will study and start to work on as every performer has that special image that sets them apart. Here are a few from that session that I was processing when this announcement was made. Here is an up-front and center shot. Love those eyes! Jessica has a figure and this shot shows it. By the way, that background is real and not photoshopped. I actually held off sharpening the image as it looks too much like a replaced background! Another figure shot of her sitting "Indian Style!" Another pose with her signature pentagram tatoo on her arm! This was the first step in creating a musical act. These days it is not only the music, it is also an image and multi-media promotion necessary to compete in a world that is media hungry for it's entertainment. FOF got in early on this concept and it has paid off as we have survived a "blood bath" and rationalization that has caused a majority of small record labels to fold. Jessica King has all the qualities to make it in this new era of modern music. We at FOF wish her all the success in this endeavor!